The Coolest Beds for Toddlers! Fun, cool and unique toddler beds make excellent gift ideas for the little ones! It is one of the best ways to get them sleeping in their own bed in no time! I LOVE finding the coolest beds for toddlers in all shapes, colors and designs and you won’t believe the ones I just found! They are so awesome you are going to wish they made grown-up versions too! 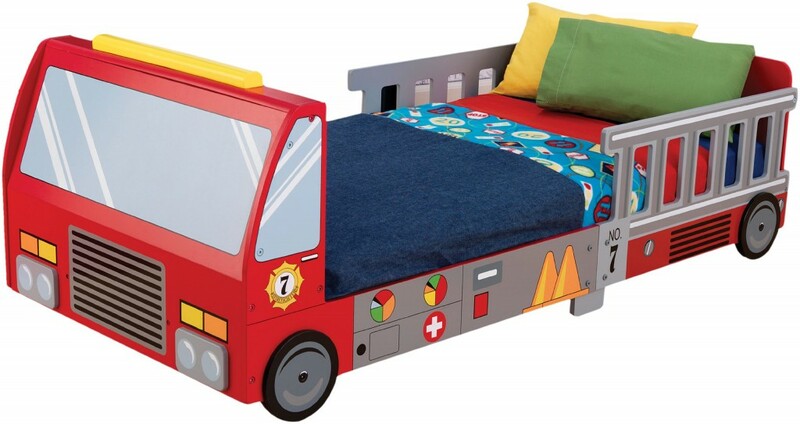 Needless to say, the best creative beds for little boys are pirate shape beds, fire truck beds and car shape beds! Look at this cool and FUN affordable pirate bed on this picture! I love how the parents chose a cool navy blue rug to put underneath! This is One of the Most Fun and Unique Toddler Beds Ever! 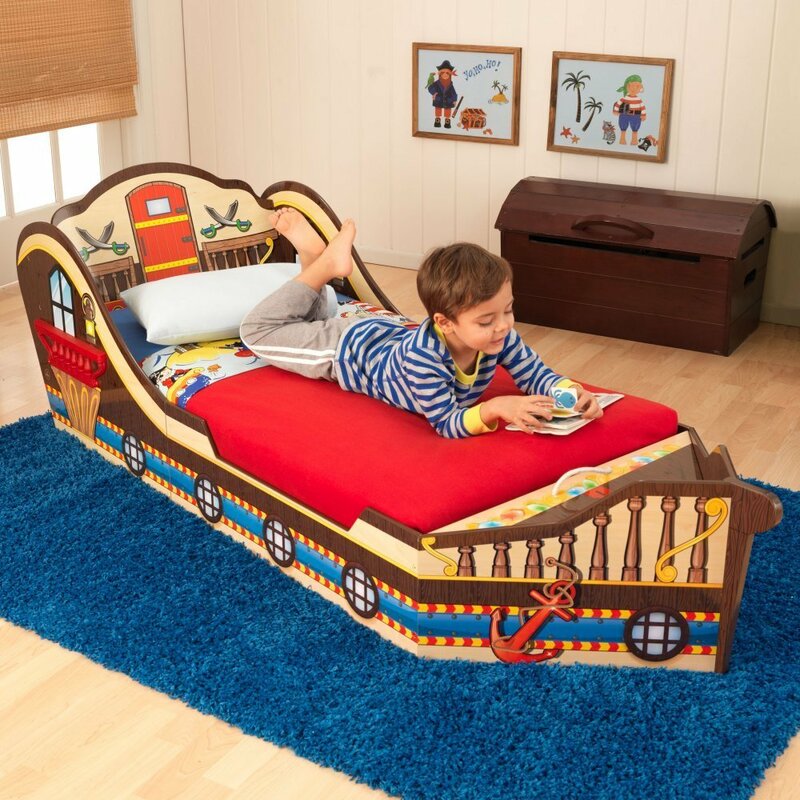 This pirate ship toddler bed is one of the most sought after bed for little boys by parents! It looks just like a real pirate ship too, doesn’t it? Every night will be an adventure! 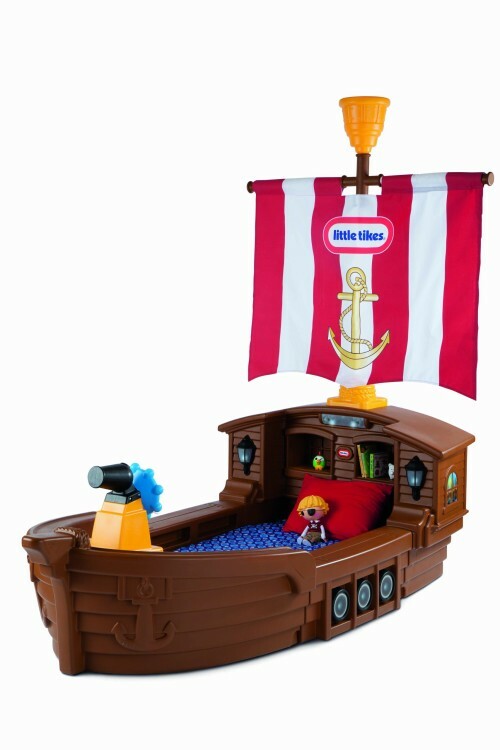 Your little one will sail away in his dreams, where he is the captain of his ship! Parents and grandparents say this is a fantastic bed for 2 year old boys and perfect for getting them to sleeping in their own beds! In fact, they look forward to bed time! I bet if they made adult versions of this pirate ship bed you would want to have one for yourself too, wouldn’t you? -Includes ship’s wheel and working lights! Gorgeous Car Shape Beds for Toddlers! Next on the most unique toddler beds being sold comes amazing the car shaped beds! They look exactly like luxurious car replicas… except they are beds! 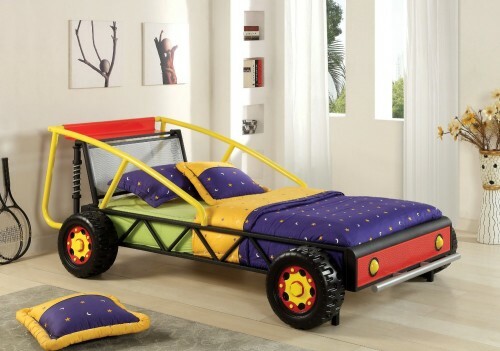 Can you imagine setting up a bedroom for your toddler boy and adding one of these ultra-cool car beds? 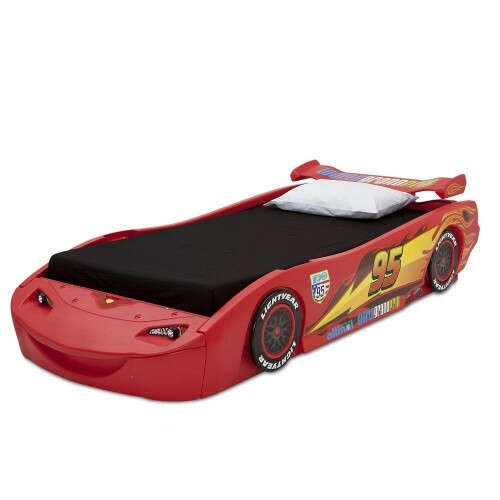 How about this gorgeous and very cute Disney Cars car shape bed for boys with lights? Your little boy will never forget his very first car! 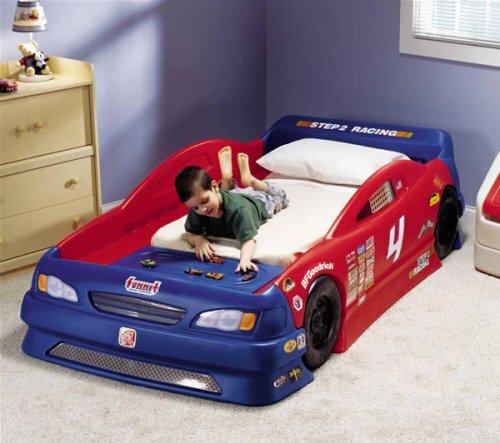 Best Car Shaped Beds for Toddler Boys! How about getting your little boy his very first red Corvette? 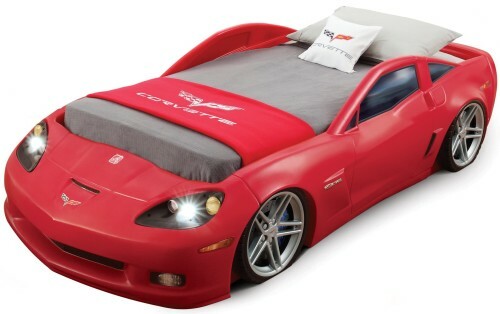 This Corvette car shaped bed is so realistic your toddler boy will really believe he is sleeping inside a gorgeous fancy car! Just like the real adult car, it also has working headlights too! Parents say it is the coolest bed ever! It will fit kids from ages 2 until about 10 years old! Car-shaped beds for toddlers are the most popular! They look amazing in a child’s bedroom and little boys love them! Look how cute this one looks and how happy this little boy is on his new bed! The high-side rails will keep them from falling at night. Happy buyers say this toddler bed is awesome and their children love it! Check out this amazing, gorgeous, fun and girly PINK car shaped bed for toddler girls! Have you ever seen anything more gorgeous than this? 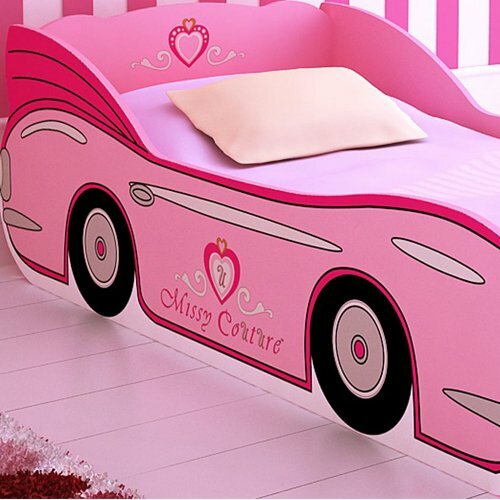 Just imagine how beautiful your little girl’s pink bedroom is gonna look after you add this awesome pink car bed? Little kids have the best beds in the world! The Most Unique Toddler Beds! How unique and unbelievable is this metal race car bed? I had never seen one like this before? 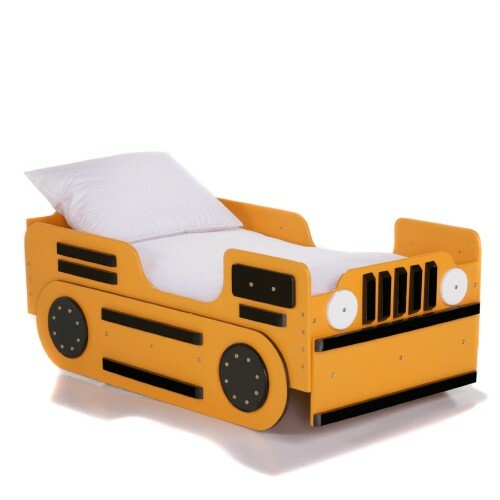 Another gorgeous metal car bed for your son! Will make his bedroom very cool! I love the red, black and yellow colors! Adorable Lalaloopsy Twin Bed for 2 to 5 Year Old Girls! What a Cute Bed for Little Girls! How cute and adorable is this colorful Lalaloopsy house bed for toddler girls? Don’t you wish you were little again so just you could also have one of these fantastic beds? Why do we adults have to sleep on boring beds? I want a cute and girly fun bed too! 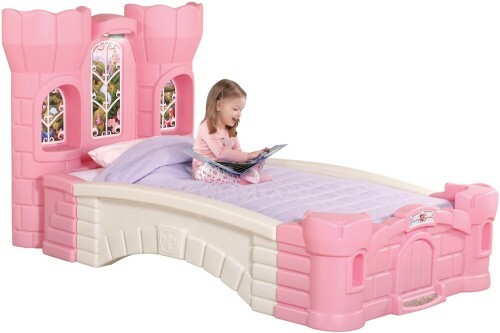 A PINK CASTLE bed for girls! OMG, each one is more beautiful than the next! I am having a blast here! 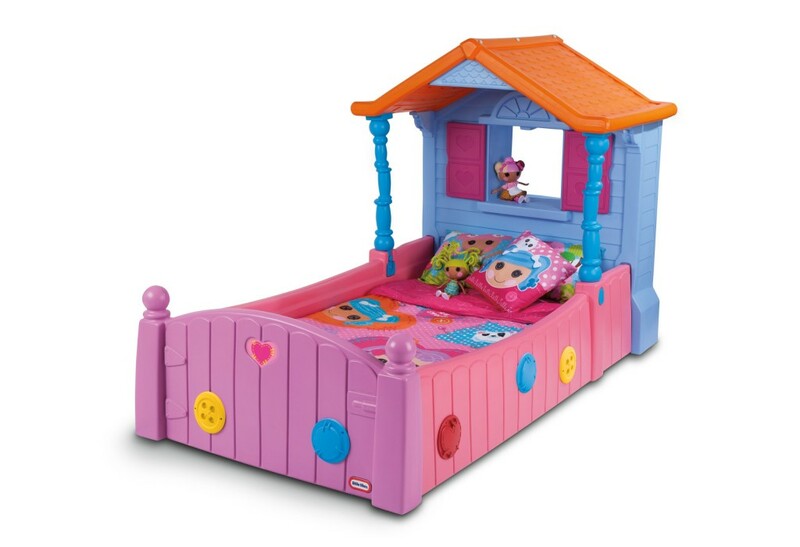 This cute bed fits little girls ages 3 until about 7 or 8 years old! Happy buyers said it’s just perfect! How cool and fun is this yellow bulldozer truck bed for toddler boys? Isn’t it perfect for your son’s bedroom? It is very easy to assemble and just perfect for a 2 or 3 year old boy! It is very sturdy too! 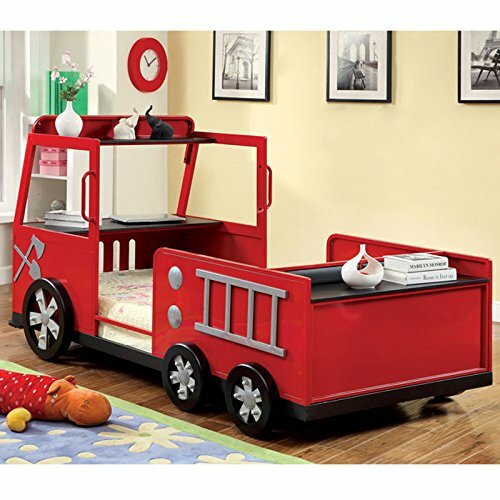 Bright Red Fire Engine Truck Twin Bed for Boys! Best Fire Truck Bed for Toddler Boys Ever! Like I said before, you can NEVER go wrong by creating a fun fire truck bedroom for your toddler boy! This is by far the best and most FUN coolest red fire truck engine bed for boys for sale! It is a very sturdy twin bed made from kid-friendly metal! Can you imagine your little boy’s reaction when he sees his new fire engine truck bed for the first time in his bedroom? How hard do you think it will be to have him sleeping in his own bed now huh? Believe it or not the price is not that bad! I think it’s totally worth it! If you are on a tight budget but still would love to buy a cute fire truck bed for your toddler boy, then you are going to fall in love with this one! It’s very affordable and very cute too! It’s also sturdy and made of wood. It’s the perfect size for a 1, 2 and 3 year old little boy! Very easy and fast to assemble! Parents and grandparents give it thumbs up! Another fun and very cool boat shape toddler bed for sale! This one is very unique and so cute! How cool and fun is the ship’s ‘deck’? You can place his favorite toys in there! 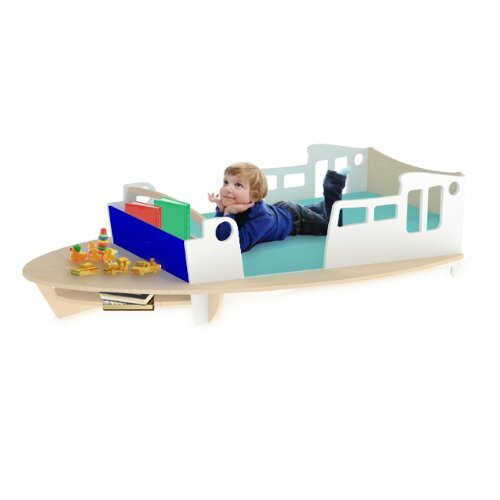 Your little one is gonna love sleeping on a ‘boat’ every night! Fits little ones ages 2 to 4 years old. 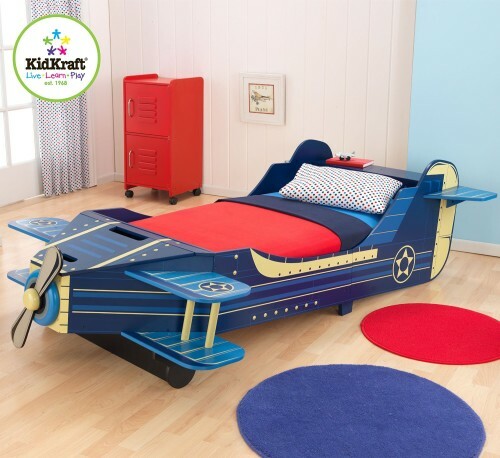 Awesome Airplane Shape Toddler Bed for Boys! It is the first time I see a cool airplane toddler bed! How’s that for your future pilot huh? Isn’t it the coolest thing ever? I bet you can’t wait to see your little boy flying in his dreams sleeping on his cool airplane shaped bed! How about getting a Fun Jeep Wrangler Bed? 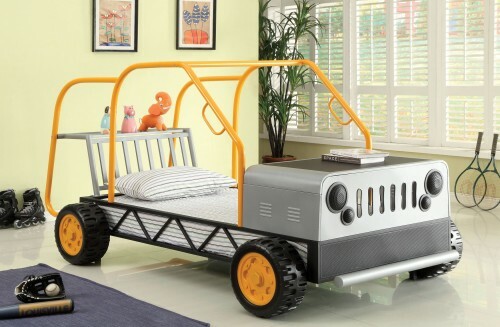 Fun Little Tikes Jeep Wrangler Toddler Bed for Boys! 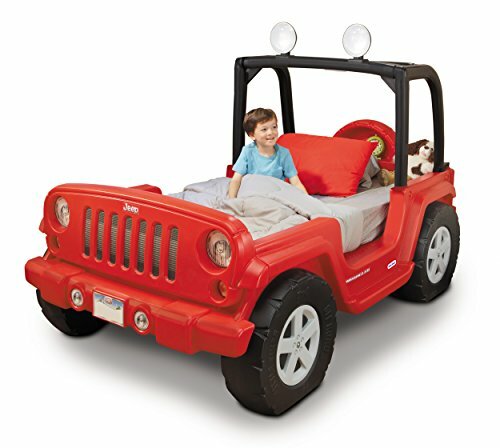 Have you ever seen anything cuter and more unique than this red Jeep Wrangler toddler bed for boys? It fits most crib mattresses and it is very easy for them to climb up because it is very low! It also has working lights! 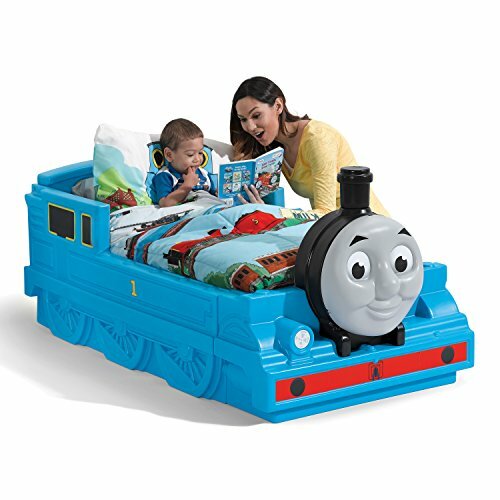 Very Cute Thomas The Tank Engine Toddler Bed! Cute, Fun and Unique Beds for Kids! I couldn’t resist showing you this adorable Thomas The Tank Engine toddler bed for sale! How perfect is it to create a ‘Thomas The Tank Engine’ bedroom for your little one? (I can almost hear the engine! Gorgeous Mickey Mouse 3D Toddler Bed! 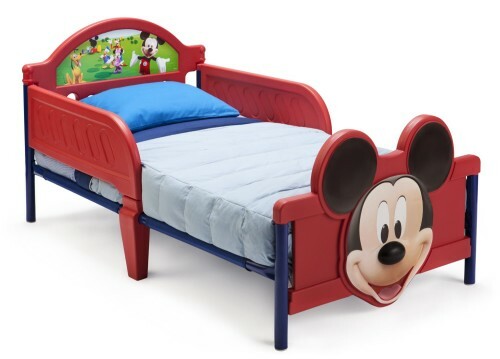 This is a gorgeous and very cheap Mickey Mouse bed for toddlers! Perfect for your little boy or little girl! It takes about 45 minutes to assemble and voila! *I hope you were able to find a super cute and fun bed for your toddler here today! *Cute Study Desks for Kids!